Home → Our Doctors → Leslie B. Cunningham, M.D. That desire led Dr. Cunningham to Ophthalmology and, once there, he knew he had made the right choice. It was 1991 when Dr. Cunningham joined the Knoxville Ophthalmology practice that was initially founded by Dr. J. Ed Campbell in 1952. He couldn’t have landed in a better place. The practice was known for combining the best in personal care of their East Tennessee patients while always staying at the forefront of advancing technologies. 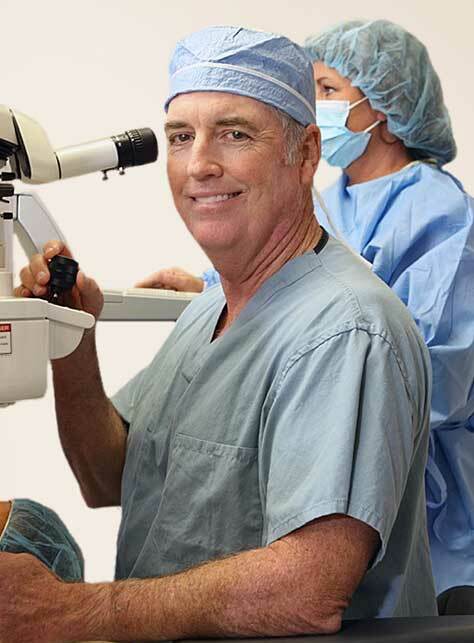 Similar to Dr. Cunningham, Dr. Philip Campbell had a strong interest in Refractive Surgery and after several years, the result was the founding of the Campbell Cunningham Laser Center. “Back in the 1980s, Radial Keratotomy (RK) technology was getting better,” recalls Dr. Cunningham. “I performed my first RK in 1992. The technology didn’t correct a wide range of refractive conditions, but it was an excellent procedure for the time and we still have many happy RK patients today. LASIK is safer, more predictable, more consistent and, of course, patients love the fast recovery. “Dr. Campbell and I were early and enthusiastic proponents of the new procedure”. Drs. Campbell and Cunningham quickly saw the need for a facility exclusively devoted to refractive surgery on site. They realized that by having a dedicated in-house laser surgical facility, specially staffed and operated in the same building as their Ophthalmology practice, both doctors could provide the convenience and continuity that would now benefit their LASIK patients as well. In 1997, the doctors co-founded the Campbell Cunningham Laser Center, East Tennessee’s first onsite surgical facility dedicated to LASIK. What has been Dr. Cunningham’s single most satisfying experience with LASIK? “It was a result of a chance meeting with a former undergraduate classmate of mine. His son was a quadriplegic and was having difficulty dealing with glasses and contacts. It was a tough situation for someone who had already been through so much. I can’t tell you how proud I was to be able to help. It gave him a newfound sense of freedom, and it was a great feeling for me to know that I was able to help out in some small way. We’ve been blessed with wonderful technology and skills, and I try to give my absolute best on each and every patient”. What lies ahead for Dr. Les Cunningham? “My hope is to one day be able to devote my energies toward providing care to those who don’t have access to ophthalmic treatment. There are 16 million people in the world who are blind due to cataracts. I’d like to make a dent in that number.” Of course, that would be after retirement. Dr. Cunningham still feels like he has a lot left to accomplish right here in East Tennessee.